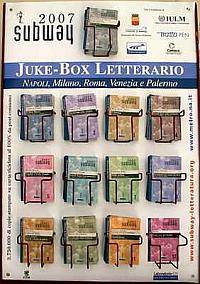 —Some benevolent organization named Napoli Subway Letteratura has returned for its fourth edition of Juke-Box Letterario, distributing free booklets (average about 16-20 pages) of short stories and essays by young Neapolitan authors. The small-format staple-bound booklets sit in racks at most metro and cable-car stops; they are gobbled up almost immediately by the waiting masses. 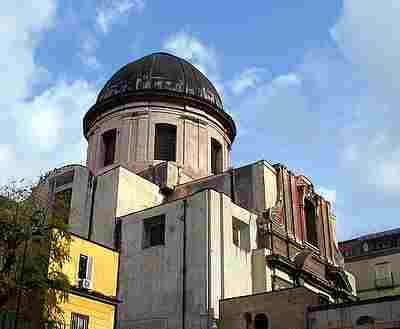 Similar projects in Rome, Milan, Palermo and Venice have met with success. —A totally modern 550-bed hospital—one of the largest in Italy—is under construction in Ponticelli, an eastern suburb of Naples. The so-called Ospedale del Mare ("hospital of the sea") was planned by local architect, Pasquale Manduca and will be "earthquake proof." It had better be, say critics of the plan, for the premises are right on the edge of the "red zone," the area near Mt. Vesuvius that civil defence planners have to evacuate in case the scourge of Pompei and Herculaneum decides to erupt again. In any event, completion of the hospital is optimistically set for 2008. —A large port for pleasure craft has just opened at Castellammare di Stabia, right at the beginning of the long Sorrentine peninsula. Marina di Stabia is billed as the largest in Campania and one of the most important in the Mediterranean. That last claim has yet to be tested, but it is attractively close to Sorrento, Capri and the entire bay; also, it much less congested than competing ports farther in towards Naples. The port can host 1,200 craft at floating piers and 200 at shore. Gee, Jennifer Lopez has already showed up in her 63-meter "Phoenix." From what I hear, she has quite a beam on her. —Some (Jason Lanier) call it "digital Mao-ism" and some call it Whitmanesque faith in the ultimate wisdom of the people. I call it "Wackipedia." Those familiar with the anyone-can-edit on-line encyclopedia, Wikipedia, know that the articles range from world-class scholarship to rabid teenagers writing about their favorite garage bands (usually their own). The Italian Wikpedia article on Antonio Bassolino, former mayor of Naples and current president of the Campania region of Italy is very short, no doubt due to the tendency of partisan know-it-alls and party hacks to delete sections that they don't agree with (a technique, you will recall, much favored by the late Josef Goebbels). The discussion behind the article is much more interesting than the article itself because that's where they shouting matches take place. The Wikimeisters have had to block the article from further editing. —I Took the Ferrari to Work Today. When I first saw one of these things coming down the tracks about three years ago, I thought they were filming another Star Trek movie. Fixed rail urban transport systems in Naples have usually been on the order of Toonerville Trolleys of the kind that unwashed urchins—the scugnizzi—hang on to the back of for free rides. The longest such rail line in Naples used to be the number 1 line that ran from Bagnoli into and through the city all the way to the east end of town at Poggioreale. Thirty years ago a ticket still cost a paltry 50 lire (ten cents). Then, they tore up the tracks for most of that stretch in order to widen roads for car traffic. The number 1 now runs between Piazza Vittoria in the west (adjacent to the Villa Comunale) and Poggioreale in the east, still a good chunk of Naples. The ticket costs 1 euro. The new tram is shown in the photo on the right. Anyway, when it passed me for the first time, I was afraid to get on and contented myself with reading the painted autograph on the side: "Pininfarina." This is in reference to Battista Farina (1893-1966), founder of the famous chassis design company that has turned out a number of snazzy versions of Maserati and Ferrari. The company still bears the name and has gone into designing classy street cars. 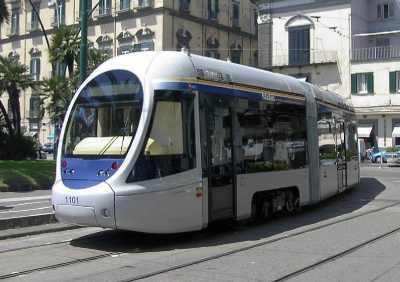 This new model is called the Sirio and is built by Ansaldo Breda, the largest Italian manufacturer of light-rail transport systems, with various models now lightly prowling urban rails all over Europe from Oslo to Ankara and, indeed, in the United States in Los Angeles, Boston, and Atlanta. This model, the Sirio, is an articulated train with driver compartments at both ends. In the interior, single rows of seats are aligned on each side, facing the center; thus, you can make easy eye contact with the person across the way or with the navel of the person standing in the aisle. The two motors run on asynchronous triphase alternating current fed by insulated gate bipolar transistor inverters and choppers. This makes me wary of spider-manning myself to the back for a free ride. Of, course, there is no back, anyway. —Turtle Point. 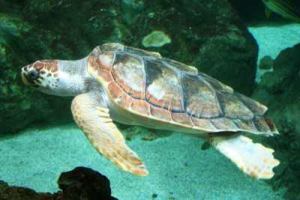 The gentle giant of the deep pictured here is the Loggerhead Sea Turtle (Caretta caretta). (I'm no marine biologist, but I think that means "turtle-turtle".) The creature is common to many of our planet's seas. While not exactly on the endangered species list, they would surely be on the battered species list, if there were such. Most of their problems have little to do with whatever naturally ails turtles; the creatures are simply victims of civilization. They wind up with cracked body shells from collisions with boats; they injure their flippers trying to struggle loose from fishing nets, or, in the worst cases, the flippers can be sliced off by the props of passing motor boats; they get fishing hooks embedded in their flesh or even swallow them; or they can simply be poisoned by pollution and, as a result, be blind or have lost their delicate sense of direction. For many years in Naples, the Anton Dohrn aquarium in the Villa Comunale did valuable veterinary work in taking in these wounded creatures from local waters. That work has now been expanded greatly by a new facility—a "Turtle Point"—on the premises of the old Italsider steel mill in Bagnoli, an area that is little by little making its way back from long decades of urban blight. The new facility is on 600 square meters and houses 23 tanks dedicated solely to caring for these creatures, rehabilitating them and returning them to the sea. Exemplars of Caretta caretta arrive from all over the Mediterranean at what is now one of the largest such rescue facilities in Europe. In 2005, the center took in about 90 sea turtles and managed to return half of them to the wild. The others did not survive. The freed turtles are outfitted with temporary tracking devices so marine biologists can follow them. There are now plans to expand the center with a larger, adjacent facility.